Tri-level townhouse with private guest quarters! 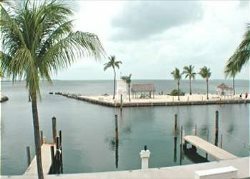 It’s time to live the Florida Keys dream! Claim a corner of paradise all for yourself in this 3-story, 3-bedroom, 3-1/2 bath townhouse with a laid-back zen décor. Two entrances afford access into the private 1-bedroom guest suite or the foyer leading up to the 2nd level main living areas. The private 1-bedroom suite comprises a generous living space with large flat-screen TV, a full-size futon that can be used for additional sleeping, a full bath, a kitchenette with full-size refrigerator, a microwave, Keurig coffee maker and a private bedroom with queen bed. Second floor is the main living area with an open concept design for easy flow from the family room to dining and kitchen. The kitchen has plenty of room for more than one cook! Stunning dark cabinetry is topped with dark granite and stainless appliances finish the elegant look. The dining table seats 6 and two patio chairs are easy to pull in for additional seating. On the third level is the guest bedroom with queen bed and a full ensuite bath. Also on this level is the grand master bedroom with a king bed, a large flat-screen TV, separate work area complete with a desk for those who cannot leave work at home, and a fashionable ensuite bath with his-n-hers sinks, an elevated spa tub with toilet and bidet. Should you ever be tempted away from your private oasis, you'll find there are plenty of ways to fill your days! Relax with friends and loved ones with something deliciously fruity in your hand and the ocean breeze in your hair lounging by one of Mariners Club swimming pools or just relaxing in one of several sunning areas admiring the stunning azure waters of the Atlantic Ocean. Really...what are you waiting for? Very friendly and competent welcome in the office. No problems with check in and check out. Good descriptions of things to do when you arrive or leave. Everything was ok for living in a holiday home. The surrounding was very nice only some dirt in the last corner of the sea Belonging to the Club.